Syria, a country in Western Asia bordered by Lebanon, Turkey, Iraq, Jordan, Israel, and the Mediterranean Sea has a total land area of 71,479 square miles and a population of over 22.5 million.Syria is among the 15 countries that comprise the ‘Cradle of civilization’. Mostly arid plateau, it does have arable land on its northeast side. Its economy is based on oil, agriculture, tourism, and industry. As privatization is not an option for government enterprises, the economy has to grow at a much faster rate to create job opportunities for its population. To this end the government is seeking to attract foreign investment into tourism, natural gas and services sectors. Spring (Mar-May) and autumn (Sep-Nov) are the best time to visit Syria weather-wise. Many visitors come as part of some pilgrim tours. The major attractions of Syria are Damascus, Hama, and Aleppo with the major attractions being the Old City, National Museum, Azem Palace. The various mosques, museums, palaces, historical architecture (including the Roman Theater) and its culture also contribute to its charm. Its cuisine is rich and varied influenced by Mediterranean, Greek, Turkish, French, and Asian cuisine. Popular dishes include shish kebab, stuffed zucchini, stuffed grape leaves, hummus, tabbouleh, shawarma, mujaddara, pastırma (camel meat), and baklawa. Lonely Planet Syria and Lebanon Multi Country Guide 978-1741046090 $19 First 50 pages is a traveler’s introduction followed by 200 pages of Syria covered by region. The rest of the guide is Lebanon. Jordan and Syria Travel Map by ITM Canada 978-1553412748 $13 Syria 1:740,000 Scale. Jordan 1:610,000 Scale. Inset maps of Damascus and Amman. The first stamps of Syria were a set of ten stamps issued in 1919 which were ‘T.E.O.’ (Territoires Ennemis Occupes) and denomination surcharge overprints on French issues from the turn of the century. The set (Scott #1 to #10) catalogs for around $110 mint and around the same for used. The overprint was changed to ‘O.M.F. Syrie’ (Occupation Militaire Francaise) the following year. French issues with the overprints were the primary issues of Syria during the period till 1925. Syria became a Mandate of France following World War I – at the time the territory included Lebanon and Alexandretta. The first original issues of Syria were a set of thirteen stamps released in 1925 showing local scenes. The set (Scott #173 to #185) catalogs for around $12 MNH and around $5 used. The designs show Mosque at Hama, view of Alexandretta, view of Hama, Omayyad Mosque in Damascus, Latakia Harbor, view of Damascus, view of Palmyra, view of Kalat Yamoun, Bridge of Daphne, view of Aleppo, columns at Palmyra, and view of Merkab. The desert city of Palmyra is a United Nations World Heritage site. Aleppo’s old town is also a UNESCO World Heritage site. A long set of nineteen stamps released on August 2, 1934 to mark the proclamation of the autonomous republic of Syria. The set (Scott #232 to #250) catalogs for around $100 mint or used. The designs show Parliament Building, Abu-al-Ala al-Maarri, President Ali Bek el Abed, and Saladin. Syria gained independence from French Mandate on April 17, 1946 following the evacuation of French troops due mainly to continued pressure from Syrian Nationalist Groups and the British. A set of six stamps released between 1950 and 1951 showing local scenes in Damascus. The set (Scott #358 to #363) catalogs for around $6 MNH and around two dollars for used. The designs show National Emblem, road to Damascus, and the Postal Administration Building in Damascus. 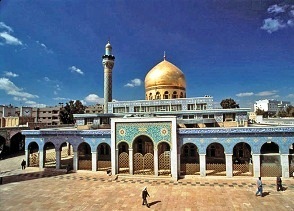 Damascus is the largest city in Syria and the metropolitan area is a governorate on its own. A set of thirteen stamps released between 1986 and 1990 showing a portrait of President Hafez al Assad. The set (Scott #1068 to #1080) catalogs for around $40 MNH and around half that for used. A number of sets portraying Assad have been released by Syria over the years and all of them catalog at a premium over regular issues from the same periods. They form a good collectible theme. Hafez al-Assad was the president of Syria from February 22, 1971 until his death on June 10, 2000. Assad launched a bloodless intra-party coup within the Baath party in 1970, known as the Corrective Revolution to gain power. He was succeeded by his son, the current president Bashar al-Assad. A stamp released on November 16, 2004 to mark the 34th anniversary of the Corrective Movement. The stamp (Scott #1561) catalogs for around a dollar MNH and around half that for used. Syria has issued a number of stamps over the years to mark the anniversaries of the Corrective Movement. They are not that highly valued yet but form a good collectible theme. The first coin of Syria was a Kingdom Standard Coinage Gold Dinar showing Crowned Shield within Sprigs in Obverse and Design within Wreath in Reverse. The issue is very rare and catalogs for close to $10K in UNC. French Protectorate Standard Coinage debut in 1921 with the issue of Copper-Nickel Piastres. The first issues have mintage into the millions and catalogs for upwards of $10 in UNC. The first gold coin was a 0.0978 troy ounce half pound issue of 1950 showing Imperial Eagle in Obverse and Inscription within rectangle above sprigs in Reverse. It has a mintage of 100K and catalogs for a slight premium over bullion value. Coins $2 and up Piastres from the 1960s onward in XF+ starts around $2. Recent Bi-metallic UNCs, Silver Coins from the 1920s and 1930s in VF+, etc start around $10. 1976 FAO UNC Set, Essais from the 1920s, etc start around $50. Gold Coins go well into the 100s. Paper Money $2 and up Recent UNC Poundage starts around $2. Recent High Value UNCs, Consecutive Serial Number Banknotes of 5-pieces or more in UNC, etc start around $10. Large Notes from the 1920s and 1930s in VF+, Scarce Dates in XF+, etc start around $50. Bundles, Early Specimens and Proofs, etc go well into the 100s. Sand bottles, spices and art are typical souvenirs of Syria. Art $20 and up 19th century historically relevant original photos start around $20. 18th century art prints start around $50. Original Cuban Political Posters go well into the 100s. Antiques $10 and up 19th century maps start around $10. Radford Syria Gold Chintz cup and saucers start around $40. Older maps Forvm Oil Lamps from the 7th century, Hellenic Glass Ribbed Bottles, etc go well into the 100s. Miscellaneous Collectibles $3 and up Postcards, pins, flags etc start around $3. Original President Assad photos start around $10 – signed varieties goes for a lot more. Iraq and Israel war medal of honors start around $50. Military Order of Cooperation and Friendships, Admiral Awards, etc go well into the 100s.